Both churches are popular venues for concerts, carol services and also for film locations and photo shots. St Luke’s has the larger capacity with seating for 450 in the nave and 200 in each gallery and Christ Church 280 in the nave with 35 in one gallery and 85 in the other. Please contact the Parish Office [0207 351 7365 or email] if you would like to hold an event at one of our churches. Our staff are committed to making your time here as straightforward and positive as possible. Even if you have been associated with organising an event here before it would be helpful if you would ensure that at every stage of planning you communicate the below guidelines to your colleagues. Concert or service? What’s the difference? A Carol Service is a service to worship God for the gift of Jesus Christ as a babe in Bethlehem. As such, in our parish churches, a member of the clergy will be present. A service will need close liaison with the clergy for its structure and contents. Generally, this will include a welcome and Bidding Prayer at the beginning of the service, at least one reading from the Bible relating to the birth narratives in the Gospels, prayers, the Lord’s Prayer and a Blessing. The clergyperson officiating will need to sign off your final draft of the Order of Service before it goes to print. Please do leave plenty of time for this to happen. We would also ask that we insert a message from our church in your programme. This will relate to Christmas, your particular charity or event and Christmas Services here in the parish. A service is not subject to the Performing Rights legislation. There is no restriction on the number of people attending a service, but experience shows us that St Luke’s church accommodates a maximum of 800 and Christ Church 350. The Directors of Music in each church are responsible for the musical instruments in the churches and should be consulted early in the arrangements to talk about the use of the organs and pianos. You can “hire” their services or those of our organists but that is a separate arrangement to the church hire. During a Carol Service photography is prohibited and it is inappropriate to applaud, although the member of the clergy involved in your event may, for example, as an encouragement to participating small children, suggest some applause at the end of the service. Any recording, audio or visual, increases the professional fees payable to all musicians. A Carol Concert is an event which is designed primarily to entertain your guests. There is no need for a member of the clergy to be present, unless you would like a spoken greeting of welcome at the beginning of the concert. Concerts are subject to Performing Rights legislation and to Fire and Evacuation guidelines. These limit the size of your audience to 500 in St. Luke’s and 260 at Christ Church. For a concert you will need to register details of numbers attending and average ticket price not later than seven days after the event. We do hope that these guidelines are clear and will enable you to organise your event with minimum complication. 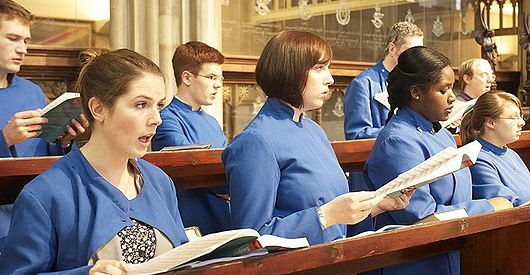 We look forward to working with you and can assure you of our very best attention for an uplifting Carol Service or Concert.